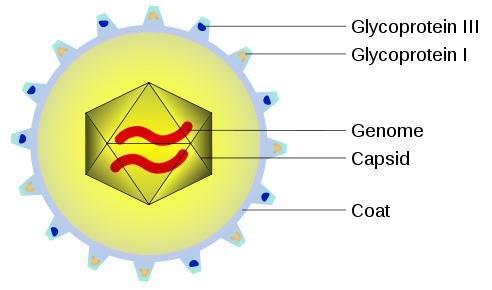 Cytomegalovirus is a member of the herpesvirus family (herpesvirus 5). It is the most common virus transmitted to the fetus during pregnancy. Approximately 1 in 100 women become infected with cytomegalovirus during pregnancy (although most remain asymptomatic). Around one third of maternal CMV infections are then vertically transmitted to the fetus. However, only 5% of fetal infections will cause CMV related damage to the fetus, with the risk highest in the first trimester. In this article, we shall look at the clinical features, investigations and management of cytomegalovirus infection during pregnancy. Fig 1 – Structure of the cytomegalovirus virion. Cytomegalovirus infection is usually asymptomatic in immunocompetent individuals. It can occasionally produce a mild flu-like illness. Alternatively, in some patients, it can cause a mononucleosis syndrome (similar to Epstein-Barr); resulting in fever, splenomegaly and impaired liver function. If maternal cytomegalovirus infection is suspected, viral serology for CMV specific IgM and IgG is performed. Presence of CMV specific IgG in mother previously seronegative (i.e. seroconversion has occurred). Presence of CMV IgM and low IgG avidity (<30%). Note: Avidity refers to the strength with which the antibody binds to the antigen. All women with confirmed cytomegalovirus infection during pregnancy should be referred to a fetal medicine specialist. In an immunocompetent woman, no treatment of the infection is required. The licensed anti-CMV drugs (ganciclovir, cidofovir and foscarnet) have potential teratogenic effects and a well-known toxicity profile (haematological and renal), and thus are not recommended for use in pregnancy. Fetal CMV infection can be diagnosed prenatally via amniocentesis and PCR of the resulting amniotic sample. This must be carried out after 21 weeks gestation because functioning fetal kidneys are required for the virus to be excreted into the amniotic fluid. If fetal CMV infection is confirmed, there is no effective therapy, and termination of pregnancy can be offered. If the woman wishes to continue the pregnancy, serial ultrasound scanning should be performed to assess for manifestations of congenital CMV. Promising results have been shown in trials using IV CMV specific hyperimmune globulin. Further research is required before widespread adoption of this as a treatment for fetal CMV infection. There is 20-30% mortality in this symptomatic group. This is often due to disseminated intravascular coagulation (DIC), hepatic dysfunction and/or bacterial superinfection.